No one knows where David Webster was born. He lived in Mobile, Alabama before moving to Pensacola, Florida around 1830. A rich man, he owned eighty four slaves until poor investing decisions left him broke. He sold all but one and moved to Galveston in 1846. When he died ten years later, he was again a wealthy man owning around twenty one city lots and thousands of acres throughout Texas. But this story isn’t about David. It’s about Betsy, his slave. She was born in Mississippi around 1780. David bought her while living in Mobile and she moved with him to Florida. His Pensacola neighbors remembered her out of all of his slaves, probably because their relationship was anything but normal. Although they never married, which was against the law, the two had an intimate relationship, sharing a bedroom. Betsy looked after David, managing his household and money. In his will, David freed Betsy leaving her the majority of his estate and sending her into legal battles as she struggled to claim her inheritance. Although the new State Constitution of Texas did not explicitly prohibit an owner from freeing their slaves, it did outlaw all free black persons from living in Texas. Already in her seventies, Betsy wanted to stay in Galveston. Betsy won her first court case upholding David’s will and granting her freedom. She inherited his houses, city lots, furniture, and two other slaves, Washington and Harry. 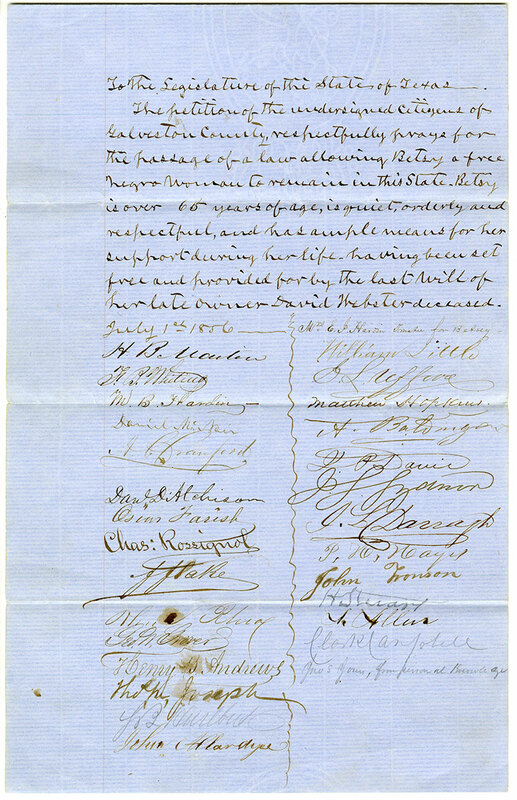 Galvestonians petitioned Texas congress on her behalf to allow her to live in the state. Betsy fought three more court cases to hold onto her property. While her last case was still pending, she died at age 103 in the house she inherited on the northwest corner of 15th and Sealy. It was a white cottage surrounded by flowers and orange trees.